Tool Hanger For Garden Sheds And Equipment locker, 4 Pcs. Tool hangers Made of galvanized steel plate, for convenient hanging of spades, rakes and garden hoses. There are 4 tool hangers in one package. Ther are 4 tool hangers as standard with some shed models, however this item can be bought as an optional additional accessory Please note that we do not have any Biohort products on display in store. However, they can be ordered here on the website or in store. Please contact The Outdoor Scene by email or phone if you require further assistance. An exceptionally handy storage space. 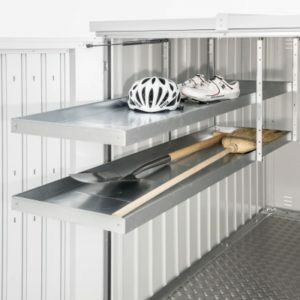 Store your tools on the back of your Highboard shed's door and create more space inside. One set contains two holders for a maximum of three. Tool holders are fitted to the inside of the door. 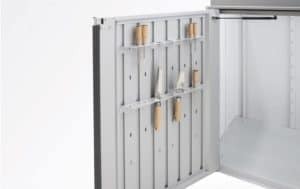 A maximum of 5 tool holders can be fitted to one door wing. Standard equipment: 2 tool holders. 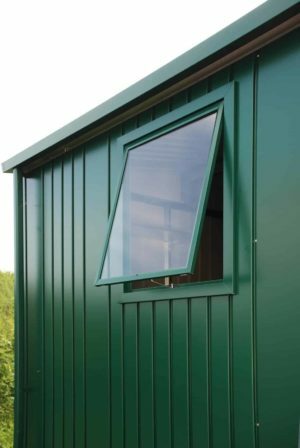 the Tool holder is available for the Highline and avantGarde sheds and canbe purchased in the colour to match your shed Please note that we do not have any Biohort products on display in store. However, they can be ordered here on the website or in store. Please contact The Outdoor Scene by email or phone if you require further assistance. 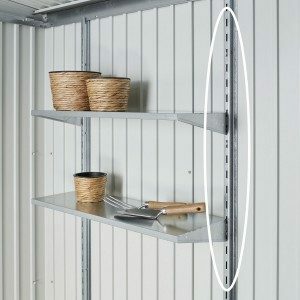 Shelf set These transform your Biohort garden shed into a storage place for small items and can be positioned anywhere they are required. Available shelf depth: 24.5 cm an (width: 72 cm). Each shelf is loadable with max. 15 kg. Standard equipment: 2 shelves (depth: 24.5 cm, width: 72 cm). Support rails can be bought separately. Please note that we do not have any Biohort products on display in store. However, they can be ordered here on the website or in store. Please contact The Outdoor Scene by email or phone if you require further assistance. 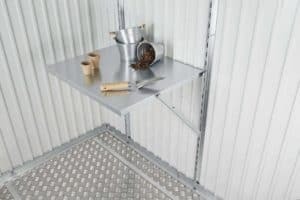 These Biohort Support Rails are required for mounting the shelf sets in the Biohort Metal Sheds. 2 pieces per package. Please note that we do not have any Biohort products on display in store. However, they can be ordered here on the website or in store. Please contact The Outdoor Scene by email or phone if you require further assistance. 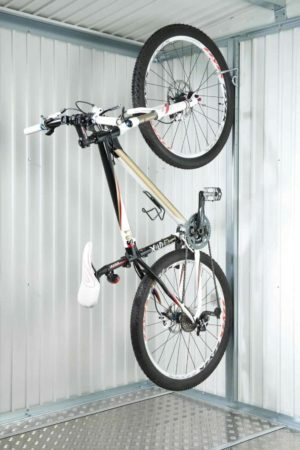 Bicycle Hanger Bikemax, 1 Pc. Bicycle Holder Bikemax, 1 Pc. Bicycle holder "bikeMax" Height adjustable in 8 different positions for bicycles with up to 29 " wheels, loop for bicycle lock included. Fits in HighLine Garden Shed. Please note that we do not have any Biohort products on display in store. However, they can be ordered here on the website or in store. Please contact The Outdoor Scene by email or phone if you require further assistance. Suspension Basket Just place on top of the frame. 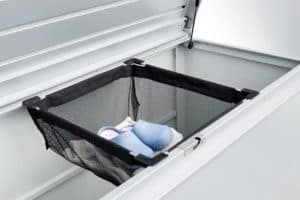 The basket, made of black polyester netting, offers extra storage space. Load bearing capacity of max. 10 kg. Please note that we do not have any Biohort products on display in store. However, they can be ordered here on the website or in store. Please contact The Outdoor Scene by email or phone if you require further assistance. 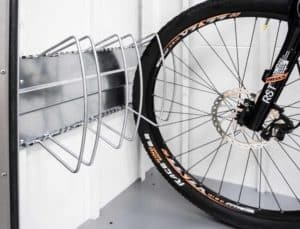 Store up to three bicycles safely and securely with this bicycle rack. 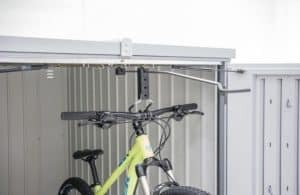 Simply slot the base plate between two shelf support rails in your Biohort shed and use the included retaining brackets to hold your bikes in place. 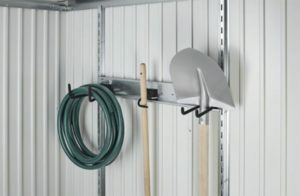 Create additional storage for your Biohort shed with this additional hook set. Perfectly suited for garden tools like shovels, rakes and garden hoses. 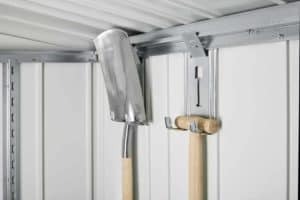 This Hook Set easily slots between two rails on your biohort shed for easy instillation. 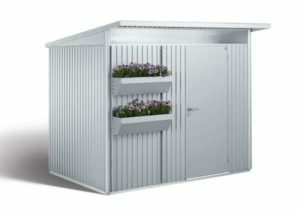 Set of 4 shelves The Standard equipment for Biohort sheds is 2 shelves (depth: 24.5 cm, width: 72 cm). 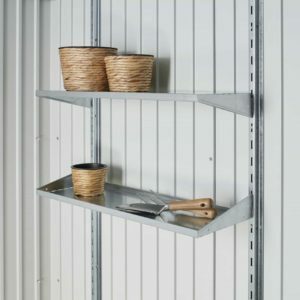 However, you may wish to purchase additional shelves and support rails (sold separately), so you can transform your Biohort garden shed into a storage place for small items and can be positioned anywhere they are required. Available shelf depth: 24.5 cm (width: 72 cm). Each shelf is loadable with max. 15 kg. Please note that we do not have any Biohort products on display in store. However, they can be ordered here on the website or in store. Please contact The Outdoor Scene by email or phone if you require further assistance. 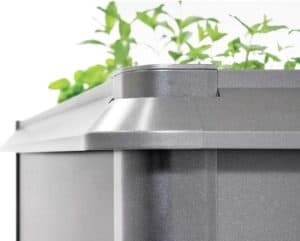 Biohort Rainwater Downpipe Set Each of the Biohort shed models come with an integrated gutter system. however, the Downpipe is an optional extra. the down pipe comes as a set of two and includes the outlet elbows and all of the necessary attachments. 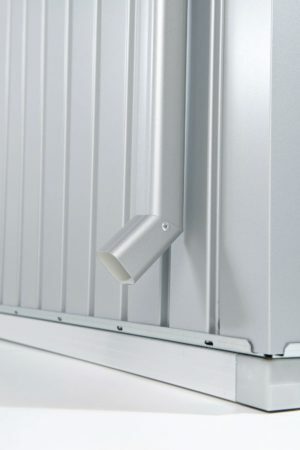 each downpipe set will vary in size and colour depending on the particular shed model chosen. Please be careful to choose the correct downpipe set that matches your shed. Please note that we do not have any Biohort products on display in store. However, they can be ordered here on the website or in store. Please contact The Outdoor Scene by email or phone if you require further assistance. 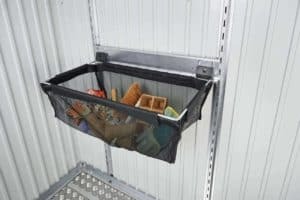 Suspension Basket with Rail Ideal for storing small objects, incl. wall rack for slotting the basket in-between 2 support rails. 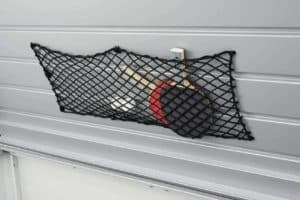 The basket is made of black polyester netting. 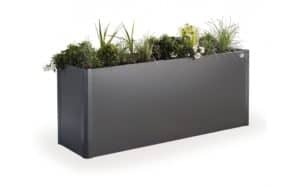 Size: W 67 x L 34 x H 20 cm This basket can be used with any of the Biohort sheds where the shelf support rails are included Please note that we do not have any Biohort products on display in store. However, they can be ordered here on the website or in store. Please contact The Outdoor Scene by email or phone if you require further assistance. Bicycle Holder Bikemax 2 Piece. 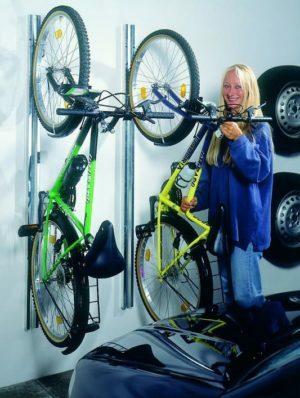 Bicycle holder "bikeMax" Height adjustable in 8 different positions for bicycles with up to 29 " wheels, loop for bicycle lock included. Fits in HighLine Shed. Protect your Vegetable bed from slugs, snails and other damaging insects with this edge protector. Designed to keep insects from crawling up the side and into the bed. 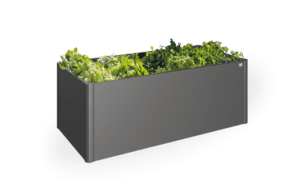 This edge is easily mounted onto your vegetable bed and lightweight. 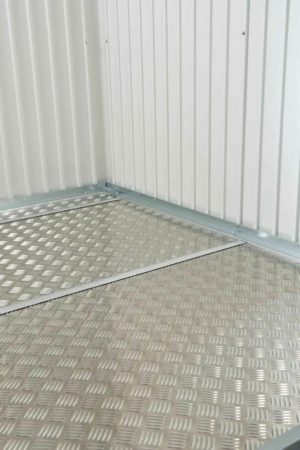 Threshold Access Ramp Can only be used then a double door is fitted; delivered in two parts for inside and outside; makes crossing the threshold much easier; only necessary when floor frame is fitted. Must be removed before closing the doors! Load capacity: max. 200 kg Length: 135 cm Please note that we do not have any Biohort products on display in store. However, they can be ordered here on the website or in store. Please contact The Outdoor Scene by email or phone if you require further assistance. 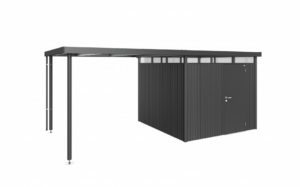 Folding Table For Garden Sheds And Equipmentlocker - Biohort Garden Shed & Storage Accessory Product. Practical & space saving solution. Please note that we do not have any Biohort products on display in store. However, they can be ordered here on the website or in store. Please contact The Outdoor Scene by email or phone if you require further assistance. Add additional gardening space and grow your plants on the side of your shed. 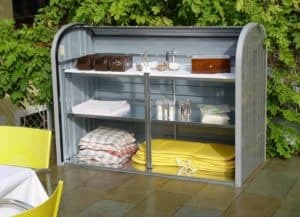 A perfect space saving measure and a great way to garden. This products includes two flower boxes and plastic inserts for easy attachment. 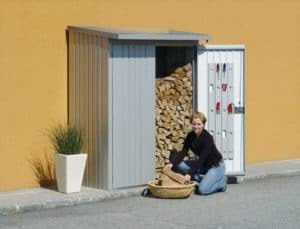 A perfect solution for holding your Woodstock shed beside a house or business wall without damaging the wall. This Rear Wall is made of hot-dipped galvanised, polyamid coated steel plate and designed to be weather proof. The back wall can also be installed after initial instillation of the Woodstock storage shed. 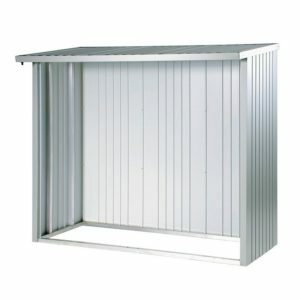 Intermediate Floor For StoreMax 160/190 2-piece, hot-dipped galvanized steel shelf with support rails. 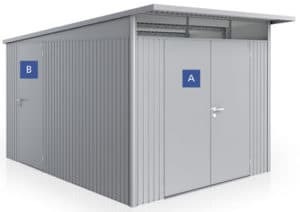 Available for two outdoor boxes: StoreMax 160 and StoreMax 190. Please note that we do not have any Biohort products on display in store. However, they can be ordered here on the website or in store. Please contact The Outdoor Scene by email or phone if you require further assistance. 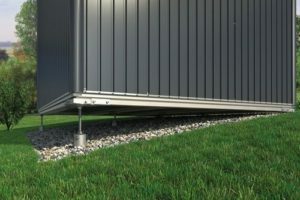 Biohort Aluminium Floor Frame Offers the equipment shed additional stability when erected without a foundation on uneven ground (i.e. lawn). The ground anchors supply guarantee safety in stormy weather. 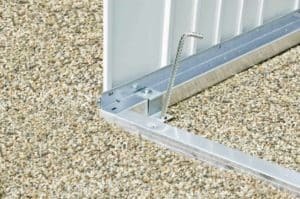 Available in various size kits to suit the shed size Set consists of aluminium pro le tubes (40 x 40 mm) with corner joints and attaching parts (storm anchors as well as screws) included. Please note that we do not have any Biohort products on display in store. However, they can be ordered here on the website or in store. Please contact The Outdoor Scene by email or phone if you require further assistance. 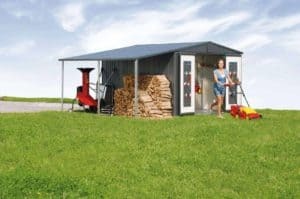 Side Canopy For Europa - Biohort Garden Shed & Storage Accessory Product. Please note that we do not have any Biohort products on display in store. However, they can be ordered here on the website or in store. Please contact The Outdoor Scene by email or phone if you require further assistance. Add extra shelf space in your MiniGarage with this Telescopic shelf system. These shelves can be height and length adjusted to suit your space needs. 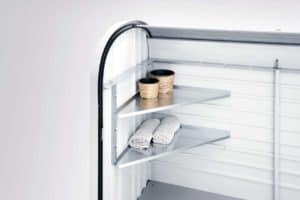 These shelves are easy to install and can be fitted where needed in your MiniGarage. Window Unit For Europa You can order a window unit for your Europa Garden shed as an additional item This complete sidewall unit with a clear plastic window set in a metal frame allows daylight into the garden shed. The window size is 50 x 58 cm. Please note that we do not have any Biohort products on display in store. However, they can be ordered here on the website or in store. Please contact The Outdoor Scene by email or phone if you require further assistance. 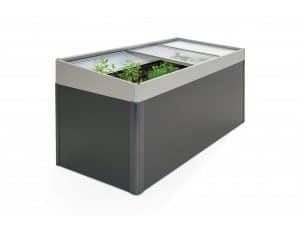 Protect your plants from frost and cold all year round with this cold frame extension. The sliding panels are tight and weatherproof, keeping frost out. Meanwhile a unique dranage system directs rainwater into the bed to help growth. Door Package For Woodstock You can now secure your woodstock by fitting Double doors to the front. 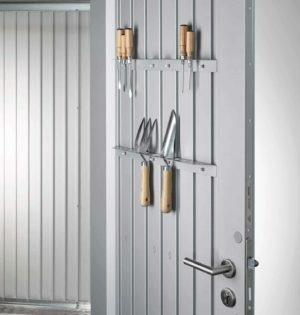 The Double doors are fitted with a twist grip cylinder lock and organiser system on the inside. 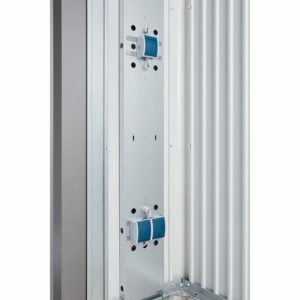 The door package is available in both colours and suitable for both the 150 and the 230 woodstock units. Door opening: width 135 cm, height 171 cm (for size 230 two small front wall panels are included in the delivery) Please note that we do not have any Biohort products on display in store. However, they can be ordered here on the website or in store. Please contact The Outdoor Scene by email or phone if you require further assistance. 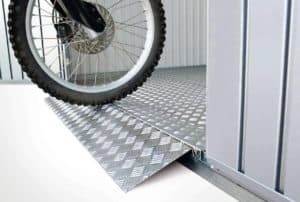 Biohort Aluminium Floor Panels Manufactured from high quality aluminium chequered plate, depending on shed size the floor consists of 3-4 panels, connecting rails included. To ensure optimal effect usage with aluminium floor frame is required Please note that we do not have any Biohort products on display in store. However, they can be ordered here on the website or in store. Please contact The Outdoor Scene by email or phone if you require further assistance. Additional Side Door Set For Biohort Garden Sheds It is possible to add an additional Side Door to the Highline and Avantgarde models. It is preferable to order the side door at the same time as the shed. the additional door can be installed in side wall to allow access to your garden shed from two sides. Please note that we do not have any Biohort products on display in store. However, they can be ordered here on the website or in store. Please contact The Outdoor Scene by email or phone if you require further assistance. Install your new Biohort shed quickly and easily with Ground Screw Foundation. 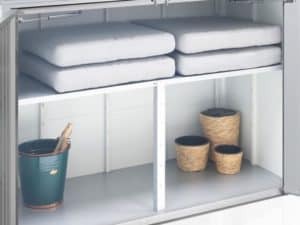 Perfect fit for all Biohort Garden Sheds and Equipment Locker. Please note that we do not have any Biohort products on display in store. However, they can be ordered here on the website or in store. Please contact The Outdoor Scene by email or phone if you require further assistance.